Probate is the court-supervised process of authenticating a last will and testament if the deceased made one. It includes locating and determining the value of the decedent's assets, paying his final bills and taxes, and, finally, distributing the remainder of the estate to his rightful beneficiaries. 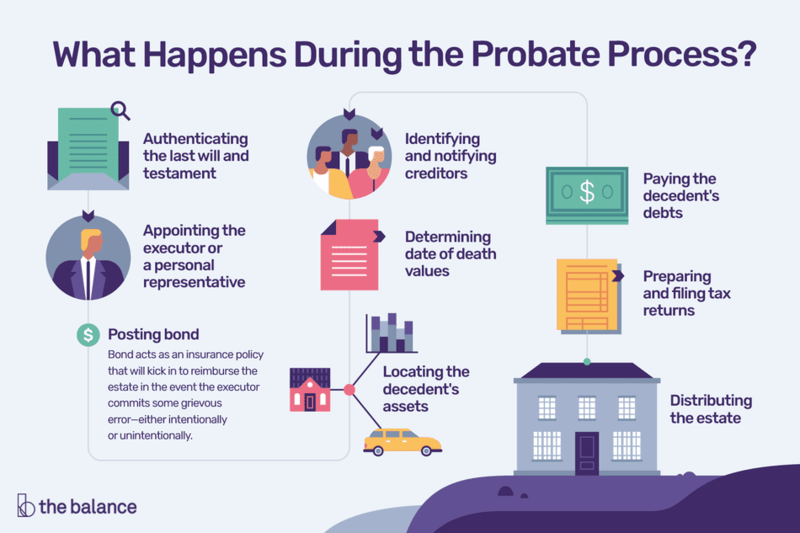 The Probate Process—When Is It Required? Each state has specific laws in place to determine what's required there to probate an estate. These laws are included in the estate's "probate codes," as well as laws for "intestate succession" when a decedent dies without a will. Probate is still required to pay the decedent's final bills and distribute his estate when he dies without a will. Although the laws governing probate can vary from state to state, the steps involved are generally very similar regardless of whether a will exists. Most states have laws in place that require that anyone who is in possession of the deceased's will must file it with the probate court as soon as is reasonably possible. An application or petition to open probate of the estate is usually done at the same time. Sometimes it's necessary to file the death certificate as well, along with the will and the petition. Completing and submitting the petition doesn't have to be a daunting challenge. Many state courts provide forms for this. If the decedent left a will, the judge will confirm that it is, in fact, valid. This typically involves a court hearing, and notice of the hearing must be given to all the beneficiaries listed in the decedent's will as well as his heirs—those who would inherit by operation of law if he had not left a will. The hearing gives everyone concerned an opportunity to object to the will being admitted for probate—maybe because it's not drafted properly or because someone is in possession of a more recent will. Someone might also object to the appointment of the executor nominated in the will to handle the estate. So how does the court decide if a submitted will is the real deal? Many include something called "self-proving affidavits." The decedent and the witnesses sign the affidavit at the same time the will is signed and witnessed. This is good enough for the court. Lacking this, however, one or more of the will's witnesses might be required to sign a sworn statement or testify in court that they watched the decedent sign the will and that the will in question is indeed the one they saw him sign. The judge will appoint an executor as well, also sometimes called a personal representative or administrator. This individual will oversee the probate process and to settle the estate. The decedent's choice for an executor is typically included in her will, but the court will appoint next of kin if she didn't leave a will, typically her surviving spouse or an adult child. This individual isn't obligated to serve—he can decline and the court will then appoint someone else. The appointed executor will receive "letters testamentary" from the court—a fancy, legal way of saying he'll receive documentation that allows him to act and enter into transactions on behalf of the estate. This documentation is sometimes referred to as "letters of authority" or "letters of administration." It might be necessary for the executor to post bond before he can accept the letters and act for the estate, although some wills include provisions stating that this isn't necessary. Bond acts as an insurance policy that will kick in to reimburse the estate in the event the executor commits some grievous error—either intentionally or unintentionally—that financially damages the estate, and, by extension, its beneficiaries. Beneficiaries can elect to unanimously reject this requirement in some states, but it's an ironclad rule in others, particularly if the executor ends up being someone other than the individual nominated in the will or if he lives out of state. The executor's first task involves locating and taking possession of all the decedent's assets so she can protect them during the probate process. This can involve a fair bit of sleuthing sometimes—some people own assets that they've told no one about, even their spouses, and these assets might not be delineated in their wills. The executor must hunt for any such assets, typically through a review of insurance policies, tax returns, and other documentation. In the case of real estate, the executor is not expected to move into the residence or the building and remain there throughout the probate process to "protect" it. But he must ensure that property taxes are paid, insurance is kept current, and any mortgage payments are made so the property isn't lost and doesn't go into foreclosure. The executor might literally take possession of other assets, however, such as collectibles or even vehicles, placing them in a safe location. He'll collect all statements and other documentation concerning bank and investment accounts, as well as stocks and bonds. Date of death values for the decedent's assets must be determined and this is generally accomplished through account statements and appraisals. The court will appoint appraisers in some states, but in others, the executor can choose someone. Many states require that the executor submit a written report to the court, listing everything the decedent owned along with each asset's value, as well as a notation as to how that value was arrived at. The decedent's creditors must be identified and notified of her death. Most states require that the executor must publish notice of the death in a local newspaper to alert creditors that she doesn't know about. Creditors typically have a limited period of time after receiving the notice to make claims against the estate for any money they're owed. The exact time period can vary by state. The executor can reject claims if she has reason to believe they're not valid. The creditor might then petition the court to have a probate judge decide whether the claim should be paid. Next, those creditor claims are paid. The executor will pay all the decedent's debts and his final bills, including those that might have been incurred by his final illness, from estate funds. The executor will file the decedent's final personal income tax returns for the year in which he died. She'll determine if the estate is liable for any estate taxes, and, if so, she'll file these tax returns as well. Any taxes due are paid from estate funds. This can sometimes require liquidating assets to raise the money. Estate taxes are usually due within nine months of the decedent's date of death. When all these steps have been completed, the executor can petition the court for permission to distribute what is left of the decedent's assets to the beneficiaries named in his will. This usually requires the court's permission, which is typically only granted after the executor has submitted a complete accounting of every financial transaction she's engaged in throughout the probate process. Some states allow the estate's beneficiaries to collectively waive this accounting requirement if they're all in agreement that it's not necessary. Otherwise, the executor will have to list and explain each and every expense paid and all income earned by the estate. Some states provide forms to make this process a little easier. If the will includes bequests to minors, the executor might also be responsible for setting up a trust to accept possession of bequests made to them because minors can't own their own property. In other cases and with adult beneficiaries, deeds and other transfer documents must be drawn up and filed with the appropriate state or county officials to finalize the bequests. An intestate estate is one where the decedent did not leave a valid will—either he never made one or his will is not accepted as valid by the probate court due to an error in the document or because an heir successfully contested it. The most significant difference is that in the absence of a will that makes his wishes known, the decedent's property will pass to his closest relatives in an order determined by state law.